2019 is going to be a game-changing year in terms of how you reach out to your prospects in your target area. In 2018, I saw an explosion of 3D content, local blogs, and thousands of realtors going digital to buy leads. These trends are here to stay. However, there are a few upcoming trends in the real estate marketing industry which will be pivotal in the coming year. The social media landscape has changed dramatically. These days simply producing unique content is not enough. You need to have a unique brand as well, and the best part of what I just shared with you is that YOU ARE YOUR BRAND and that is your secret weapon, you just may not know it or believe it yet. Stick by me, and that’ll change. On top of that, content distribution is more important than ever. Keeping the ever-changing social and customer acquisition landscape in mind, I am going to share the top 5 real estate marketing trends that define 2019. Marketing automation bots are on the rise. These bots allow visitors to have a meaningful and logical conversation on your website, without you having to monitor the live chat. Apps like, ManyChat, Intercom, and many others allow you to build complex automation series that can be triggered based on certain rules when a visitor lands on your website. For example, you can trigger a message asking a potential home buyer, whether they want to book a showing. People can type their information right inside the chat client which will be transmitted directly to you. Another useful example of using chatbots is the ability to sync with Facebook messenger ads. Facebook messenger ads are a great way to communicate directly with your audience via Facebook messages. Instead of replying to each individual person who responds to your real estate ads, you can setup ManyChat and automate the whole system. In fact, you might notice the chatbot or FB lightning bolt chat icon in the bottom right hand corner of our website. I’m not just blogging about it, I’m a believer. To quote Notorious BIG, “I’m not only a client I’m the playa president.” What I love the most about the chatbot feature is that it runs 24 hours a day, 7 days a week, and unlike voicemail, actually leaves the user feeling like they got the information they needed. Mind you, setting up the questions, auto responses, and the “trees” or “funnels” to guide and capture the prospect’s info requires a little bit of a learning curve, once it’s done-can be duplicated over and over and over. In 2019, I predict the rise of chatbots and many agents will adopt this technology so that they do not miss out on their website traffic especially since many of the Millenials are now starting to purchase and have grown in an era of instant information and chatting/texting people more than talking. I did a whole video training on Social Proof and the bare minimum social profiles you need to be on in order to be found on the internet. 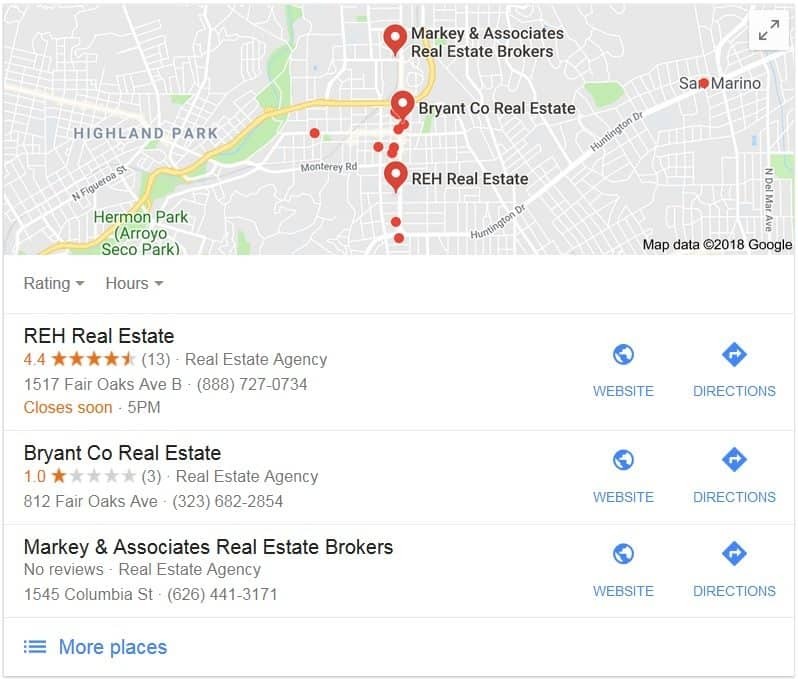 If someone is looking for a real estate agent in your city, who shows up on a Google search? If you’re not coming up on the first page of Google you are losing opportunities. Don’t even get me started if someone directly Google’s your name and doesn’t find anything. That’s the worst. Trust…it’s the magic word in real estate, however, it’s getting harder to achieve in 2019. You must be more creative and invest more time and money in order to gain trust in homeowners. Why? Because, people in your farm area are getting bombarded with all sorts of marketing and advertising, like newsletters, bus benches, and print. So, how do you get trust in 2019? How do you make sure the prospect trust you to be their real estate professional? Well, online reviews for one thing. If you aren’t getting online reviews, you’ll be in trouble. Sure, there will be those few examples of Agents who have built such a strong name for themselves that they’ve been able to get by with little or no online reviews, but those Agents are few and far between. The vast majority of us NEED online reviews especially as the new generation of buyers move into the market. An e-book covering everything a home buyer needs to know about your neighborhood. Blog posts about the real estate market and industry trends. All of these marketing campaigns are quite different from what an average real estate professional spends their time on. Therefore, you should spend your marketing dollars on these kinds of advertising. Email Marketing has been around for a long time. In 2019, the real estate marketing industry will realize the full potential and power of email marketing. It’s still considered the best form of marketing by many experts, and they are right. You have a database and you are wondering how you can engage them? Email marketing & retargeting ads are pretty much your best bet. However, email marketing will change in terms of the content that gets pushed to prospects in 2019. Those generic emails “just sold and just listed” don’t work that well unless you have a pre-existing relationship with people that you are blasting those emails too. And even still, they don’t care about real estate 90% of the time. Therefore, an emerging trend that will dominate most of 2019 is the design of your email and the content within it. In 2019, you should focus on creating emails targeting different segments of your database. Sometimes a simple text email works best. Create a design that’s very vertical (for mobile), well spaced out, and try to include some hyperlocal content like news, events, and deals. Also, don’t worry about being right the first time. Just experiment, measure, and make 1 adjustment to the email. Change the design or the content. And do this, over and over and over again – this process is called A/B testing and it’s essential to do if you want to break through and develop trust in the prospect. Case study of clients (for example, if their property sold over asking). What did you do to promote their property? Monthly open house invites. Also, personalized open house invites. Single property blasts and why do you think its a good investment. Maybe add a free investment portfolio with your email. I did a whole training on 3DTV’s were all the rage in 2010. They are all but dead now. 3D movie theater sales have taken a nasty fall. Google’s street view is amazing-but ask yourself, how often do you use it as opposed to just regular Google maps? Yes. I do appreciate it and use it on occasion, but do I absolutely need it? Could I survive without Google street view? Probably. 3D Tours don’t necessarily sell homes, but you still want them. I just summed up exactly how I feel about 3D Virtual Real Estate Tours. They are phenomenal, but I’ve sold and continue to sell many a home without them. I have however, NEVER sold a property without professional photography. Yes. I have seen some agents get by with photos from their camera phone, and in a sellers market, you might be able to get away with that, but in a buyer’s market, you’d be doing your clients and yourself an injustice by just relying on camera phone pics-especially in poorly lit areas. I used to argue that the tours were time savers as I would instruct buyers to visit the 3D tour prior to visiting the home. This was supposed to be less disruptive to my seller clients as well. What I discovered was that my 1) sellers didn’t know that my marketing was working because no one was visiting their house, and 2) the buyers I redirected to the 3D tour felt as though I was pawning them off and it was even harder to build a relationship with them. So truth be told, the 3D tours didn’t help me sell the home. It also bears noting that our MLS systems only show photos natively, which makes you start to question the value of the 3D Tours. 3D tours do serve a purpose, and yes, it is a little self serving. Sellers still love seeing 3D tours of their home. It has a WOW factor, and if all things were equal, and it was between you and someone else who didn’t offer them, who do you think they are going to pick? The answer is obvious. The agent with the most tools. Here is what isn’t so obvious: the amount of internet juice you’d get from showcasing these 3D Virtual Tours on your site. The reason most real estate agents don’t get traffic on their site is because they don’t have enough content. The average agent thinks that all they have to do is put up an IDX feed and a couple blog posts and the business will come rolling in. This couldn’t be further from the truth. 3D virtual tours are great content because it keeps the user on your site. The longer a user stays on your site, the more valuable your site is in the guys of Google. The best ways to use these tours is to embed the tour onto a page in your site and share that page with your clients, and on all your social media profiles. In 2019 videos are still Queen & King of the internet. My personal experience is that real estate agents have an aversion to video. This provides a HUGE opportunity for those who dare to stop giving a 💩 about what other people think about them. I did a video training on 5 Cheap Tips to Make Your Real Estate Videos Get More Views And Be More Effective. Watch that video when you have a chance. If all you are doing is posting videos of your properties, you will discover that most people aren’t looking at them other than the seller and yourself. Truth is, those video walk-thru’s are boring. Yeah, some have the occasional drone aerial view, and some clips of the city, but really most real estate videos don’t do anything to sell the property. Get yourself in the video and start selling. You are in sales-accept it and move on. Start pitching the property. You being in the video will not only get more views, but it will help promote the property and yourself. If you don’t have any listings yourself, ask a colleague if you can use theirs. If you aren’t going to feature a property, make a video talking about the process or about a particularly difficult transaction and how you saved the day. People, relate to people and relate to imperfections. You don’t have to be perfect and the video doesn’t have to be professionally edited. In many cases, the more raw the video is, the better believe it or not. I like using a tool called Magisto as it makes it easy to edit videos on the go, and when I really want to go crazy I use Adobe Premier. The most important part of making videos is getting started. The first few videos you make won’t be so great. So what!? You’ll get better and more comfortable as time goes on. My wife gave me some good advice when she shared with me that I looked like a “robot” in my videos. That’s when I decided to start letting more of my personality show. I also discovered that 50% of my energy was lost in front of the camera, so I had to increase my enthusiasm level by nearly double. Be sure to share your video on Facebook, YouTube, Instagram TV, and don’t forget to embed EVERY video you make on a page in your site. In 2019, a successful real estate professional must create and upload multiple videos every month on their page.